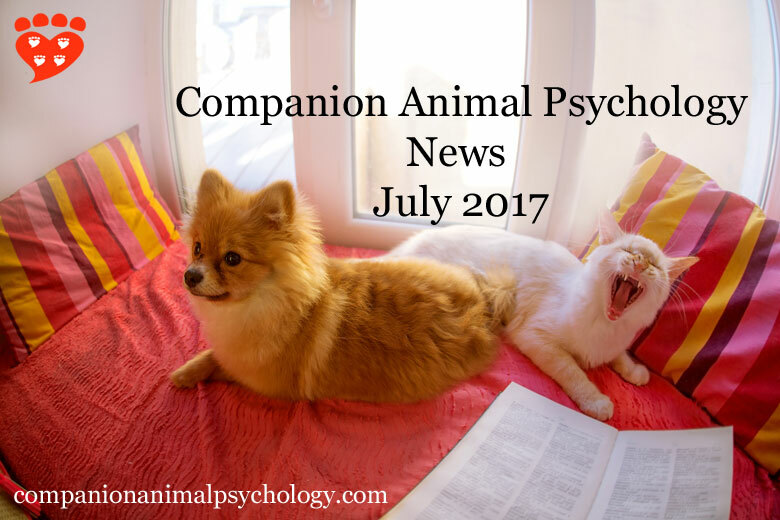 July’s round-up of the latest news on cats and dogs. Dr. Rebecca Ledger uses the Five Domains model for forensic animal behaviour analysis by Kat Littlewood and David Mellor PhD. How the mental experiences of animals can be inferred for animal cruelty prosecutions in Canada. Remember to play. Trumping animals and their homes: Seeing light in dark times by Marc Bekoff PhD. Some advice on how to maintain hope in the face of depressing news. What determines a cat’s coat? Brandon Baker speaks to Dr. Margret Casal, associate professor of medical genetics, to find out. An intriguing introduction to the genetics of coat colours. “What about dogs who are scared of toys that make noise or big/novel objects?” Enrichment for fearful dogs by Erica Beckwith CTC. Never force your cat when training. Pam Johnson Bennett on ways you can offer your cat choice. Why kids with pets are better off by Hal Herzog PhD looks at the results of a study of the impact of pets on children that surprised the researchers. And it’s never too soon to start to help a dog who is afraid of fireworks. Good and bad ways to help, by Julie Hecht. Mog author Judith Kerr to publish new book. Vancouver bans pet stores selling puppies and kittens, and so does North Plainfield NJ. The number of overweight pets has increased, according to a new report. Being friendly is in dog’s nature, say scientists. New research looks at genetic variation in dogs and wolves. Feline foraging toys: How to implement, motivate and stage the difficulty level. Webinar by Ingrid Johnson for Pet Professional Guild. Weds 26th July, 4pm – 5pm (EDT). Do you understand your dog? Fascinating podcast with Professor Paul McGreevy. The Animal Training Academy podcast with Kate Mornement PhD. Kate Mornement talks about how she learned about positive reinforcement training, her PhD research on assessing shelter dogs, and some of her favourite animal training stories. Thai cats. A breeder is working with Kasetsart University in Thailand to save the Suphalak breed of cat. Beautiful photos accompany this story. Lincoln Animal Ambassadors recently interviewed me for their blog. Thanks to Allison for such great questions! How strong is children’s attachment to their pets? At Psychology Today, I wrote about how children’s attachment to their pets is linked to friendship and caring behaviours. What your cat’s nose knows takes a look at the role of chemical signals in your cat’s life. Understanding the importance of scent and pheromones for felines can help us improve their welfare. Did we evolve to love dogs? This guest post from Kristi Benson CTC has got people thinking. Rewards, welfare and the animal’s perspective in training. My round-up of the Train for Rewards blog party. The book club is taking a break this month, but will be back in August with Lee Dugatkin’s How to Tame a Fox (and Build a Dog): Visionary Scientists and a Siberian Tale of Jump-Started Evolution . And the Companion Animal Psychology t-shirt continues to sell well. It is available in many colours, and 100% of the proceeds go to the BC SPCA Maple Ridge, which is my local shelter. Companion Animal Psychology is a participant in the Amazon Services LLC Associates Program, an affiliate advertising program designed to provide a means for sites to earn advertising fees by advertising and linking to Amazon.com, Amazon.ca and Amazon.co.uk.